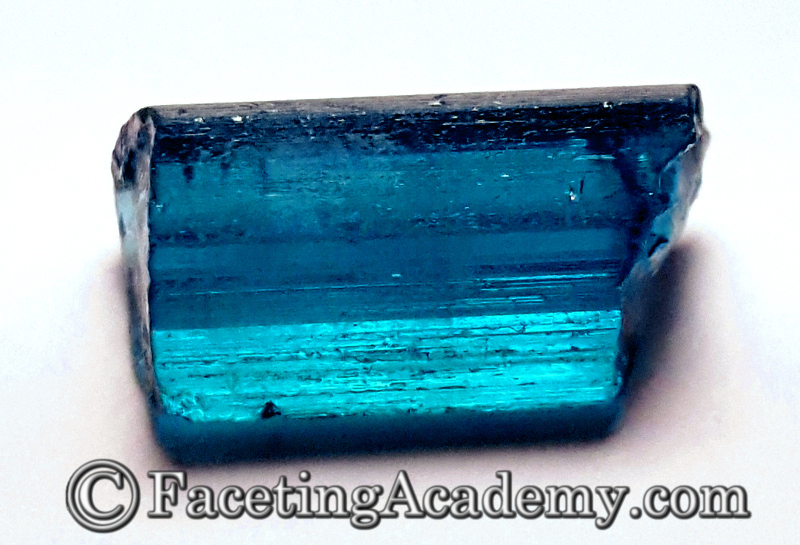 One of the questions most commonly asked by faceters who are getting past the beginner stage is how to deal with “Closed C” Tourmaline – a uniaxial, anisotropic gem that often displays strong dichroism. Anisotropy refers to differences in the binding forces between the atoms forming a crystal, according to their orientation within the crystal structure. This feature of physics affects the propagation of light through the material, giving rise to the feature of double-refraction. Double-refraction is the splitting of one ray of light, as it enters the material into multiple rays, each of which is polarized differently (vibrating in different directions). The split rays travel through the material at different velocities, and may experience differences in selective absorption – causing them to present different colors upon exiting the material. This is pleochroism. In uniaxial gem materials, we often use the term “dichroism”, for two colors. In Tourmaline the differences between the colors can be very strong: We often even have a cool hue on one axis and a warm hue on the other! Anisotropic materials contain either one or two pathways along which double refraction is not observed. These are called “optic axes”. Gemstones belonging to the tetragonal, hexagonal and trigonal systems are called “uniaxial” because they have only one such direction (optic axis). They split light into two total rays. Gemstones belonging to orthorhombic, monoclinic and triclinic systems are called “biaxial” because they have two such directions of single refraction (optic axes). They split light into three total rays. 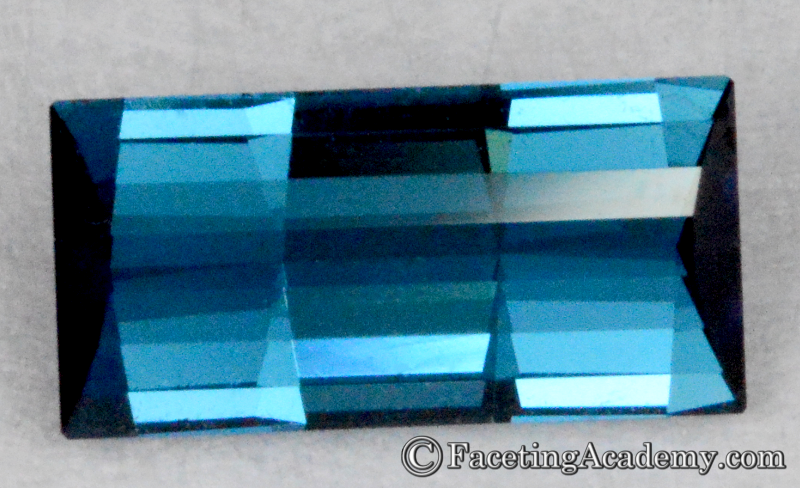 Tourmaline is a trigonal system crystal, so it’s uniaxial (has one optic axis). In uniaxial crystals the optic axis is called the “C” axis – which runs along the longitudinal direction of Tourmaline “pencil” crystals. The other axes are referred to in the singular as the “AB axis”. This is because light behaves the same along any path that is through them, perpendicular to the C axis. 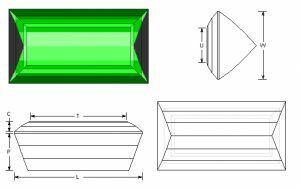 This means Tourmaline can deliver different colors based on the path light travels (relative to the crystal structure) through your finished gem. 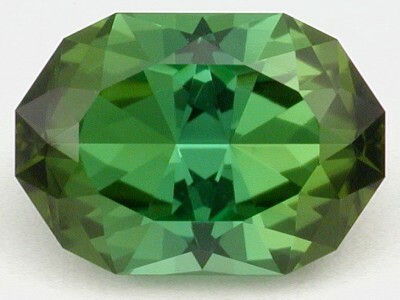 This is important to us because in colored gemstones, the quality of color accounts for 60%+ of valuation. In the Faceting Academy paradigm, our primary focus is maximizing economic return on our rough investment. So, keeping that 60% valuation factor in mind, we don’t make much distinction between a “closed” or completely black C axis, a very-dark C axis, and a C axis that’s an undesirable color. For practical purposes in maximizing value, project planning, and design selection these things are all the same. 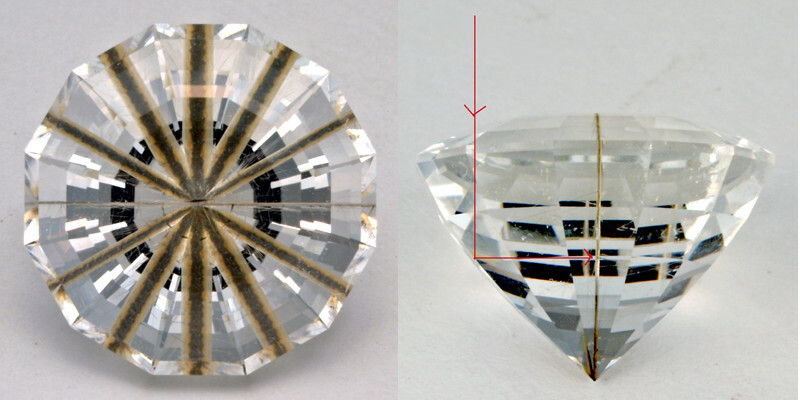 The left half of the image shows the face-up presentation of a SINGLE needle inclusion, centered in the gem. The right half of the image shows a profile view, illustrating how the pavilion mirror facets give us a side-view of the needle from various positions around it. Note the attractive AB axis color is only pure where pavilion facets are reflecting a view straight across the AB axis. Examine the photo closely, beginning at the 6 o’clock position and working your way around the gem. Notice how quickly a slight change of view through the crystal allows the C-axis color to intrude. And, facets reflecting light from straight down the C axis display only C-axis color, excluding AB color entirely. The volume calculation for the standard step design in a 2:1 L/W is .736, and for the second design is .785 – for a difference of .049. 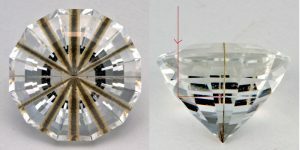 By changing from the standard step cut to the chopped-end cut, we not only enhance our color presentation, we also preserve 6.6% additional weight in the finished gem. If you want diagrams for the above designs to play with you can download a PDF of the basic pencil cut here. And, you can download a GemCAD file of the basic pencil cut here. You can download a PDF of the chopped-end pencil here. And, you can download a GemCAD file of the chopped-end pencil here. 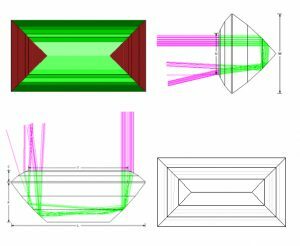 TWO additional faceting designs with more life and efficiency, including the “Inverted Bars for Closed-C” design used to cut the closed-C Indicolite at the top of this article.